Often times we get confused when we see play, and we do not identify it with real learning. We do not value the academic advantages children gain by playing. In his book, Play, how it shapes the Brain, Opens the Imagination, and Invigorates the Soul, Dr. Stuart Brown states, "play isn't the enemy of learning, it's learning's partner. Play is like fertilizer for brain growth. It's crazy not to use it." By now you have noticed your child has access to our "dramatic play center" at least once a week. During the school year, the center transforms itself into such things as a grocery store, a farm shed, a beach house, a cabin, a pet store, a flower shop...the options are unlimited since the identity of the playhouse emerges from the ideas the students bring. The next time you visit the classroom, listen to the children as they play. 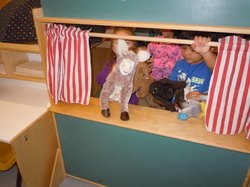 They are often "practicing" what they are learning in our dramatic play center. According to Brown, "play involves multiple centers of perception and cognition across the whole brain...it just lights everything up." Later in his book, Stuart states that he believes that "lack of play is like malnutrition, a health risk to the body and mind." You can support our dramatic play by donating ideas, and supplies for our play house. Ask your child what the playhouse should become next, then follow the dream. Will it become an imagination station? An art studio? A bank? A beauty parlor? And so, with that belief in mind, we will play. If you remember back to your own school experiences, you will probably remember something related to a science lesson, like planting your first seed in a cup, watching mold grow on a piece of bread, or using a microscope or magnifing glass to complete an investigation. In kindergarten, students are always asking questions about how and why the world works. I love using the Magic School bus to drive my science instruction. The Magic School Bus video and book library are a valuable resource and I frequently use them to introduce new units of study. You can revisit the videos I am using on YouTube. Brain research shows that students need to be exposed to information repeatedly before it becomes part of their long term memory. There is value in allowing your child to review the Magic School Bus videos at home, and by sharing the experience, you have the opportunity to use scientific language with your child. Check out the links I have added for you below, or just explore the Magic School Bus library for yourself, it's the perfect virtual field trip.